That Thursday after a delightful breakfast at the Heathman, we drove our rented car out to the Willamette valley. For those unaware, the Willamette valley produces some of the finest pinot noirs in the world. A morning of tastings confirmed that fact as we bought a number of bottles for immediate consumption and few to lay down. It soon came time to address the issue of lunch, and the hotel had helped us with that. 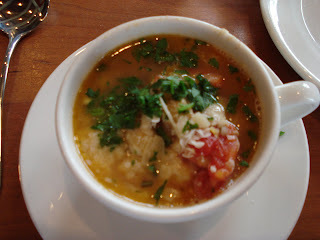 The Dundee bistro was the top choice, and we decided to give it a shot. It’s a nice little restaurant with an excellent wine list, and was full of the tourists from the wineries. We actually saw a group that had been at every winery we visited. I love that so many restaurants around Portland print menus just for that day. It presents the image of freshness of materials, it could be complete bs, but I’m a sucker for it. Since it had a cool and windy day with a high of 63, I took advantage of the chicken soup. It did its job of warming me up, though I wish there had been more chicken. Don’t get me wrong, the corns, garbonzo beans and kale were delicious, but where were the droplets of chicken fat? We went right onto the entrees, and my father decided to on a two part plan. He would order the Italian sausage for his lunch and get an order of the fries for the table. Of the three entrees, this ranks last. That sounds much worse than it was. 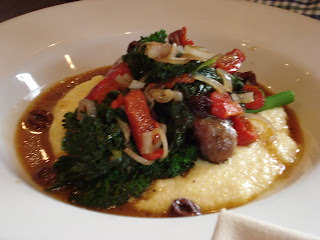 This was a nice sausage over polenta with plenty of extra accoutrements like kale, peppers, olives, and broccolini. These were damn good French fries. 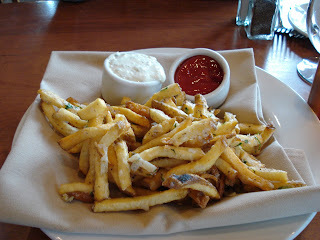 Hand cut, with a light coating of cheese and seemingly imbibed with white truffle oil, we fought over these fries. The mayonnaise that came with was pretty tasty as well. 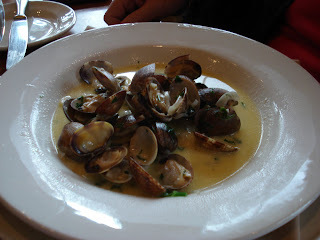 My mother again took advantage of Portland’s proximity to the water and ordered the Puget sound manilla clams. A simple dish, this was done very well. Simmered in a broth of local pinot gris, these clams had a different taste than the ones on the east coast. Honestly, who can pass up short ribs? If you can, tell me how? 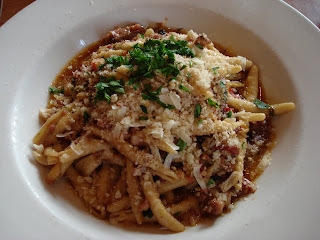 I had to get the chopped short ribs and pancetta with garganelli, and I was not disappointed in any way Ok, maybe there was more pasta than meat, but I would drive to Dundee just to get this dish. Needless to say, we had gotten too much to eat. We did decide to placate the waitress and look at the dessert menu. I kicked myself when I saw it. I should have ignored the chicken soup and saved room. They had a bacon menu, complete with a locally farmed heritage pork! I hope this catches on as a trend across the US. Forget sweet desserts, after dinner should be about cheese and bacon.